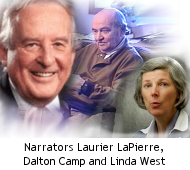 A Country by Consent was produced by Bill Dunn and Linda West of West/Dunn Productions in Ottawa. Content has been vetted by specialists in Canadian history including the Public History Group at the University of Victoria, which includes pre-Confederation and post-Confederation specialists. This group was under the supervision of Dr. Peter Baskerville, then Chair of History, University of Victoria, BC. Artistic Productions Limited, which trades as West/Dunn Productions, has been producing films and audiovisual materials for over 20 years. Other productions include television documentaries, Normandy Dream and Spitfire Pilot, which aired in prime time on CBC-TV, and the recent theatrical feature documentary, Hoodwinked: The Myth of Free Trade. We began this Canadian history project at the dawn of the digital revolution as a response to seeing educational materials in the new media creeping into Canadian schools from foreign suppliers whose content reflected a different culture. A presentation on the history of communication, for example, included songs about “the pony express to Kansas City” instead of references to voyageurs and canoes. At the same time, Canada was in the throes of another constitutional debate. We decided to approach Canadian history from the theme of the constitutional evolution of the country so we could put these recurring debates in their historical context. A constitution is the system of fundamental principles according to which a nation, state or group is governed. But it’s not just a legal document setting out the basic rules, rights and responsibilities by which a country is organized. It also expresses the philosophy of the country - how its people relate to each other and what values are important to them. Canada’s federal structure is a much-needed model for the rest of the world. It is a form of government that can accommodate different interests and protect minorities within a democratic system. Why “A Country by Consent”? Canada is not a country based on ethnic uniformity like many countries. It is not a country forged by the fires of civil war or wars of unification. It is a country which has evolved and been held together by the agreement and will of the various groups who have helped build it over the years. It is a country by consent. The content is organized into 27 chapters, many with an audiovisual introduction. The text is enhanced with additional film clips, interviews, essays by guest historians, hundreds of archival images, satellite maps and definitions. Project initiated with the support of Heritage Canada. “Normandy Dream” with Cpl. Jack Fleger courtesy Artistic Productions Ltd.
for generously submitting to our video interview and supporting us in the early days of this project. Video production by: Artistic Productions Ltd.
C 6859 Anti-conscription parade, Victoria Square, Mtl. PA 11027 John Wood and family outside log cabin, Erwood, Sask. PA 62132 Quebec lower town, gigs & balconied bldg. Abbott, Elizabeth/ Careless, J.M.S./ Legrand, Jacques (1990). Chronicle of Canada. Montreal: Chronicle Publications. Avis, W.S., Drysdale, P.D., Gregg, R.J., Scargill, M.H.(1973). The Gage Canadian Dictionary. Toronto: Gage Educational Publishing Ltd.
Bercuson, David/ Abel, Kerry/ Akenson, Donald H./ Baskerville, Peter A./ Bumsted, J.M./ Reid, John G. (1992). Colonies: Canada to 1867. Toronto: McGraw-Hill Ryerson. Bercuson, David and Granatstein, J.L. (1988). The Collins Dictionary of Canadian History 1867 to the Present. Toronto: Collins Publishers. Berton, Pierre (1972). Klondike: The Last Great Gold Rush 1896-1899. Toronto: Penguin Books Canada/McClelland and Stewart. Bowers, Vivien and Garrod, Stan (1987). Our Land: Building the West. Toronto: Gage EducationalPublishing Ltd.
Braithwaite, Max (1877). The Hungry Thirties. Toronto: Natural Sciences of Canada Ltd.
Carter, Sarah (March 1989). “Two Acres and a Cow: ‘Peasant’ Farming for the Indians of the Northwest, 1889-97.” The Canadian Historical Review Vol.LXX No. 1. pp.27-52. Collins, Paul and Sheffe, Norman (1979). Exploration Canada. Toronto: Oxford University Press. Creighton, Donald (1970). Canada’s First Century 1867-1967. Toronto: Macmillan of Canada. Finlay, J.L. and Sprague, D.N. (1989). The Structure of Canadian History. Scarborough, Ontario: Prentice-Hall Canada Inc.
Francis, R. Douglas/ Jones, Richard/ Smith, Donald B. (1992). Destinies: Canadian History Since Confederation. Toronto: Holt, Rinehart and Winston of Canada. Francis, R. Douglas/ Jones, Richard/ Smith, Donald B. (1988). Origins: Canadian History to Confederation. Toronto: Holt, Rinehart and Winston of Canada. Gay, Peter and Webb, R.K. (1973). Modern Europe. New York: Harper & Row. Graham, Gerald S. (1968). A Concise History of Canada. London: Thames and Hudson. Granatstein, J.L. / Abella, I.M./ Acheson, T.W./ Bercuson, D.J./ Brown, R.C./ Neatby, H.B. (1990). Nation: Canada Since Confederation. Toronto: McGraw-Hill Ryerson Ltd.
Hardy, W.G. (1960). From Sea Unto Sea: The Road to Nationhood 1850-1910. New York: Doubleday. Harper, J. Russell (1978). Painting in Canada, A History. Toronto: University of Toronto Press. Harris, R. Cole and Matthews, Geoffrey (1987). Historical Atlas of Canada: Vol.1. Toronto: University of Toronto Press. Harris, R.Cole and Warkentin, John (1974). Canada Before Confederation. Toronto: Oxford University Press. Jenness, Diamond (1955). The Indians of Canada. Ottawa: National Museum of Canada. Jones, Mary Fallis (1978). The Confederation Generation. Toronto: Royal Ontario Museum. LaPierre, Laurier (1967). The Apprenticeship: Canada From Confederation to the Eve of the First World War. 13 Radio Scripts. Toronto: CBC International Services. LaPierre, Laurier (1992). Canada My Canada: What Happened? Toronto: McClelland & Stewart. McMillan, Alan D. (1988). Native Peoples and Cultures of Canada. Vancouver: Douglas & McIntyre. Masters, D.C. (1967). The Coming of Age: The Modern Era 1914-1967. 13 Radio Scripts. Toronto: CBC International Services. Matthews, Geoffrey and Morrow, Robert (1985). Canada and the World: An Atlas Resource. Scarborough: Prentice-Hall Canada. Miller, J.R. (1989). Skyscrapers Hide the Heavens. Toronto: University of Toronto Press. Moodie, Susanna (1962). Roughing It In The Bush. Toronto: McClelland & Stewart. Nader, Ralph (1992). Canada Firsts. Toronto: McClelland & Stewart. Palmer, R.R. and Colton, Joel (1965). A History of the Modern World. New York: Alfred A. Knopf. Scott, F.R. (1977). Essays on the Constitution. Toronto: University of Toronto Press. Smith, A.J.M., ed. (1943). The Book of Canadian Poetry. Toronto: W. J. Gage & Co.
Stanley, George F.G. (1969). A Short History of the Canadian Constitution. Toronto: Ryerson Press. Tait, George (1962). One Dominion: The Story of Canada from 1800-1900. Toronto: McGraw-Hill Company. Tobias, John L. (December 1983). “Canada’s Subjugation of the Plains Cree, 1879-1885.” The Canadian Historical Review Vol. LXIV No. 4. pp.519-548.